Many of you glass folks will certainly recognize this glass pattern in the photo below, and more than likely any novices out there will recognize it as well. This particular pattern was introduced in 1936 and remained extremely popular until the company closed in 1982. Imperial Glass company is responsible for this well-known glass pattern called Candlewick. If you have one of these Candlewick banana boats in your possession, then you have a real treasure because the one below sold for almost $3000! This gorgeous Candlewick 3 ball banana stand #103E sold for almost $3000 in 2017! Imperial Glass Corporation introduced Candlewick, its pattern Number 400, in 1936. Earl Newton, Imperial’s Chicago sales representative, developed the pattern. The name candlewick was adapted from candlewicking, a popular Colonial needlework design. Over 650 different forms and sets are known. Although produced primarily in crystal (clear), other colors exist. The pattern was extremely popular and remained in production until Imperial closed in 1982. This rare Candlewick 400/223 tri-stem cake plate sold for almost $1700 in 2016. During its heyday, Candlewick was sold at large department stores such as Filene’s, Gimbel’s, and Macy’s. Five and dime stores such as Kresge, McCrory, and Woolworth also sold candlewick. After a brief period of ownership by the Lancaster-Colony Corporation and Consolidated Stores, Imperial’s assets, including its molds, were sold. Various companies, groups, and individuals bought Imperial’s Candlewick molds. Mirror Images of Lansing, Michigan, bought more than 200. Boyd Crystal Art Glass, Cambridge, Ohio, bought 18. 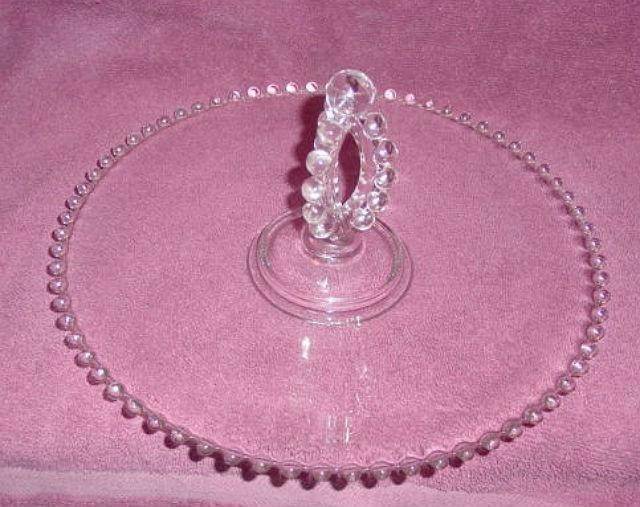 Candlewick is identified by its beaded glass bottoms and rim design. 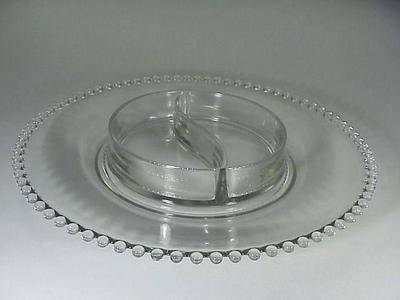 Beware of similar patterns produced by Anchor Hocking’s Boopie pattern, Libbey, and many other companies. Investing in Candlewick references books and comparing pieces found in the field with their illustrations are the best methods to make certain the piece being bought is Candlewick. This 137 pc. 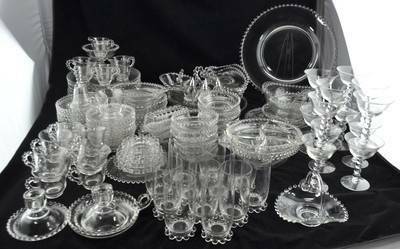 set Candlewick elegant glass service for 12 sold for almost $1400 in 2012. The late 1980s through the 2000s were the golden age of Candlewick collecting. Many buyers were replacing missing pieces or expanding an existing service. A National Candlewick Collectors Club existed until the mid-2000s. Since the 2008-2009 Great Recession, the prices for commonly found and hard to find Candlewick pieces declined in value. A small cadre of Candlewick collectors have kept the high-end of the market strong. Many collectors wishing to dispose of their collections have found it more advantageous to sell their collection as a single lot than to break it apart. The secondary market is flooded and is likely to remain so for decades. Clear, older candlewick has a slight grayish or bluish look when held to the light. This was corrected in later production. Older pieces also have flat ground rims. This Candlewick chip and dip sold for$265 in 2013. Common forms such as the creamer and sugar with matching tray, covered candy dish, pieces from the four-piece dinnerware setting have minimal interest. 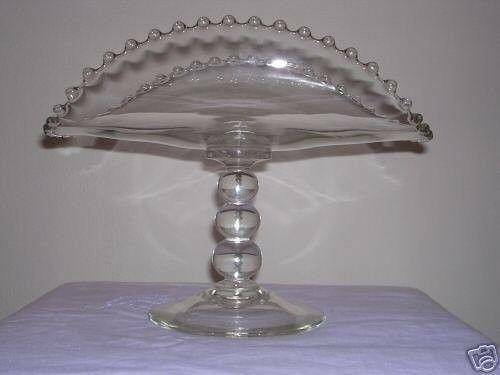 Harder to find forms such as the 400/186 7” vase, 400/68F fruit tray, or 400/131D 16” platter still bring high prices. Most Imperial Candlewick is unmarked. A few pieces made after the 1940s are marked with a capital “I” superimposed on “G”.